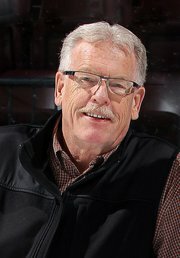 Recently I asked Ken Andersen, the official photographer for the Peterborough Petes, if he would take a few pictures of me with a couple of players who had meant a lot to me over the last 4-5 years. The Petes' captain, Jack Walchessen, and their unstoppable, tireless fireplug, Joey West, had become close friends and were such a blessing and encouragement to me especially during this past year. The pictures turned out surprisingly well! Of course Joey and Jack looked great but to get a shot of me that was better than my horrific passport photo was quite a challenge. Ken took on the job and I was happy with the results. He cropped the other two guys out of the picture and sent along this mug shot for promotional purposes. What am I going to promote? Beats me! Anyhow, I thought I'd use Ken's photo here on Pilgrim Scribblings and as my profile pic on Facebook! Please keep it off your dartboards! and a lovely picture of a great cousin it is!! You are a handsome pilgrim!!!! he didn't photoshop you, right??? (ha, ha. ha).